We’ve been working with garage door systems for more than ten years, and we’ve seen every type of problem that can occur. From faulty circuit board wiring to damaged door panels and broken springs. Our technicians know how to fix any type of problem quickly and safely. No matter what issue is affecting your system, count on us to find the perfect solution for it. Your garage door is fitted with a set of springs that help to support and counterbalance its weight. If these components start to wear out, they're tension may need to be adjusted. If they become too worse for wear, or when they break, they need to be replaced as quickly as possible. A broken spring will make it impossible to use your door, and trying to perform the required replacement task by yourself can be dangerous, so it's best that you leave it up to our professional technicians. A garage door opener is a complex device that is in charge of automating the performance of the system. When something goes wrong with this unit, it can be difficult to ascertain exactly what went wrong. Our team works with units of every make and model, including major industry leaders like LiftMaster, Genie and Chamberlain, to name a few. Opener replacement is always a viable option as well, as there will eventually come a time that your current model will need to be upgraded and replaced with a more modern option. 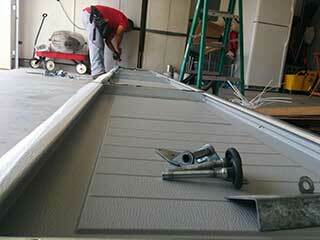 Our team will be more than happy to help you with both the shopping and the installation process. Metal garage door panels and tracks can be damaged in various ways, and this can affect the system’s performance or its security or insulating capabilities. It will also ruin the door's curb appeal (when it involves the panels), which can be a real drawback if you’re intending to put your house on the market. Our team will be able to quickly remove these dents, and, if necessary, to even replace entire sections of your door with new panels. If you’re looking for a fast and professional service provider, Garage Door Repair Big Lake is the company for you. Whether it’s an emergency repair service that you need or some general troubleshooting that will uncover what's causing your door to malfunction, you can count on our team for assistance. Give us a call today, or use our online system to book a service appointment.